Product #22134 | SKU 20416 | 5.0 (based on 1 rating) Thanks for your rating! 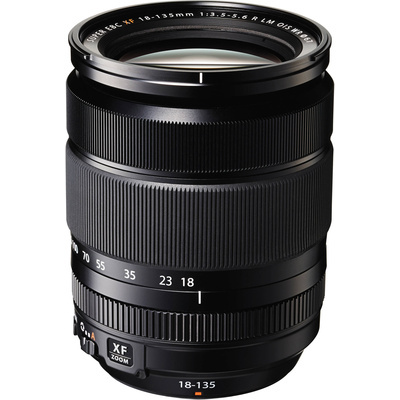 The Fujifilm XF 18-135mm f/3.5-5.6 R LM OIS WR Lens is a wide-angle to telephoto zoom lens designed for Fujifilm X-mount mirrorless cameras, where it provides a 35mm-equivalent focal length range of 27-206mm. Its optical system comprises 16 elements in 12 groups and includes four aspherical elements and two extra-low dispersion glass elements to maintain an overall compact form factor as well as reduce chromatic aberrations and distortions throughout the zoom range. An HT-EBC multi-layer coating has also been applied to lens elements to suppress lens flare and ghosting to realise contrast-rich, colour-neutral imagery. Benefitting this lens' use in difficult lighting conditions, an enhanced optical image stabilization system compensates for up to five effective stops of camera shake to produce sharper imagery with slower shutter speeds. For working in fast-paced situations, an inner focusing system, coupled with a linear AF motor, produces smooth and quiet focusing with a max AF speed of just 0.1 seconds. An enhanced optical image stabilisation system, which includes dedicated OIS Unit Lenses with a wide range of corrective movements, compensates for the appearance of camera shake by an effective five stops to benefit working in low-light conditions and with slower shutter speeds. This enhanced OIS system employs a redeveloped algorithm, which checks for camera shake 8000 times per second and controls the optical system at a rate of 16,000 times per second, to correct for the slightest amount of camera shake. Two high-precision gyro sensors with quartz oscillators also work to detect both high and low frequency shakes in order to compensate for a wide range of camera movement types. Great All Purpose lens making it a great light weight travel lens. Adequately sharp at all focal lengths and very easy to use with the excellent image stabiliser.